But thou Bethlehem Ephratah, though thou be little among the thousands of Judah, yet out of thee shall he come forth unto me that is to be ruler in Israel; whose goings forth have been from old, from everlasting" (Micah 5:2). "When he had gathered all the chief priests and scribes of the people together, he demanded of them where Christ should be born. "And they said unto him, In Bethlehem of Judea: for thus it is written by the prophet" (Matt. 2:4,5). 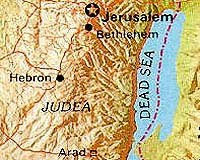 Located just five miles south of Jerusalem, Bethlehem was the home town of David, who became king. It was the place where Rachel, mother of Joseph and Benjamin, was buried. "In Rama was there a voice heard, lamentation, and weeping, and a great mourning, Rachel weeping for her children, and would not be comforted, because they are not" (Matt. 2:17,18). "But in the last days ..."
"Therefore will he give them up, until the time that she which travaileth hath brought forth: then the remnant of his brethren shall return unto the children of Israel" (Micah 5:3). Micah reminds us that the First Advent of the Messiah was not for the purpose of setting up the Messianic Kingdom. Christ came back then to be rejected. As a result. Jesus gave them up for judgment. The Romans destroyed Jerusalem; and sold the Chosen People on the slave markets of the world. "the remnant of his brethren shall return!" And that brings us to our generation. Out of the Jewish holocaust of World War II, wherein six million Jews were slaughtered, the nation of Israel was birthed. We celebrate the birth of our Savior each December, but we are fully aware that today, Israel is poised to be blessed by the return of the Great King who was born in Bethlehem. In spite of all that Satan might do to prevent heaven’s kingdom, nothing can stop it. Jesus is coming to this generation. We know this because of the rebirth of Israel. The "remnant" has returned! Bethlehem was also the city of Ruth and Boaz. Ruth is a type of the Church. She was a Gentile bride who married Boaz, the kinsman redeemer. Ruth was concerned that Naomi’s kinsman redeemer buy back the land that Naomi had lost. Through the marriage, Naomi’s land was redeemed. This is a prophecy fulfilled in 1948. Check out the history of the Jewish return and you will find that Christians helped to bring the Jews back to their ancient homeland. "Whither thou goest, I will go; and where thou lodgest, I will lodge: thy people shall be my people, and thy God my God" (Ruth 1:16). That is the way Christians feel about the Jewish people. It is as if Jesus has put a love in our hearts for Israel that is nurtured by the Holy Spirit. We are so thankful that Jesus is our Savior! We long to see Him. The baby in Bethlehem’s manger deserves our loyal devotion. It is a privilege to be in the bride of Christ; to love His relatives; and help them regain their Promised Land. Let us continue to pray for the peace of Jerusalem and look for the coming King of kings to establish the Messianic kingdom in this generation.